We love to do a lot of child-driven art. Usually i just set my preschooler up with the art materials, and let him create. 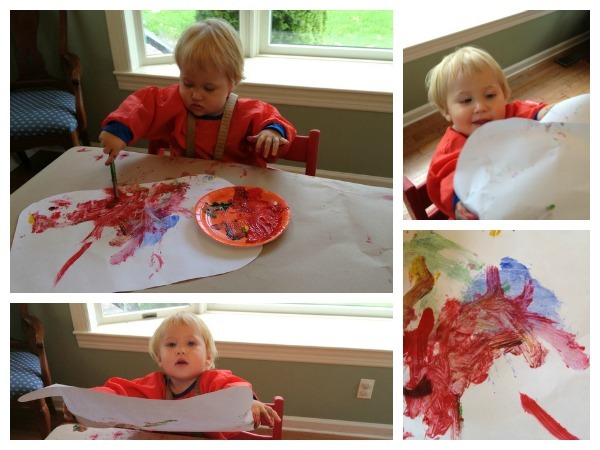 My baby is now also starting to create his own art, and we now have baby’s first painting! My 14 month old painted with a brush for the first time yesterday. He has finger-painted before, and I’ve done handprints with him, but this was his first time dipping brushes into paint and putting it on paper. He loved it! I was setting up paint for my older son, and my baby kept pointing to the paint and saying “mine.” So I set him up with a paper, paint, and a brush. I placed the paint on a paper plate for him. I let him lead the experience. When he wanted a new paint color, he pointed to his color choice, and to the spot on the plate where he wanted the paint. He dipped his brush into one color and then another. He placed streaks of color on the paper, mixed the colors together, and changed his grip on the brush several times. I sat back and watched (except for the picture-taking and the occasional interception of paint headed for his mouth!). When he was done with his painting, he picked up his painting and held it out to me, and looked so proud. 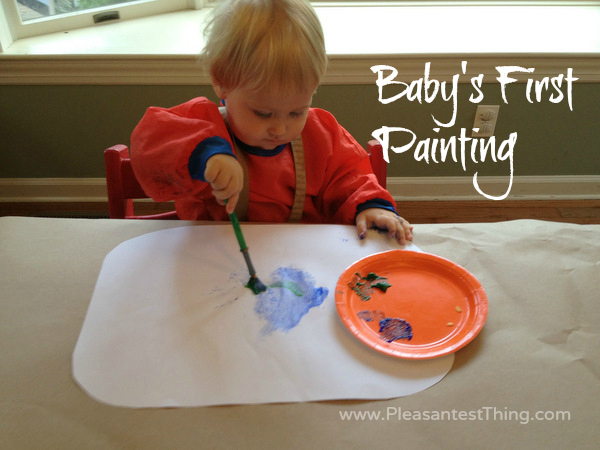 We’ll still be fingerpainting, which he enjoys and which is also great fine motor activity, but we will also add painting with a brush into our activities. I will have to watch out for his attempts to paint his mouth, but other than that, my baby is now painting!